Daniel has been hand-crafting fine jewellery for over 20 years, specialising in unique commissions for individual clients and luxury boutiques. His experience and expertise have become well-known in the wider industry, interesting the likes of Lego who commissioned a range of Star Wars figures in precious metals platinum, gold and silver. Xbox also approached Daniel to create golden coins for their latest game release, Sea of Thieves. Originally taught to make jewellery by his father, Daniel started his 5-year jewellery apprenticeship at the age of 17 and within 10 years had started his own company. 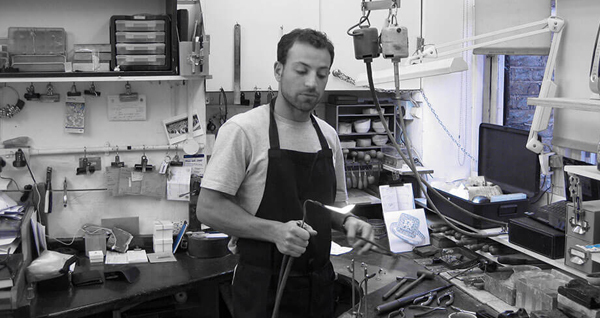 Daniel is still based from what was his father’s workshop, surrounded by the traditional tools which have created beautiful jewellery for over 60 years. Daniel never tires of the satisfaction and pride in hand-making stunning jewellery which goes on to be loved and enjoyed for many years, often handed down from generation to generation.